This is Part III Dell Technology World 2018 Storage Announcement Details that is part of a five-post series (view part I here, part II here, part IV (PowerEdge MX Composable) here and part V here). Last week (April 30-May 3) I traveled to Las Vegas Nevada (LAS) to attend Dell Technology World 2018 (e.g., DTW 2018) as a guest of Dell (that is a disclosure btw). PowerMax is the new companion to VMAX. Positioned for traditional tier 0 and tier 1 enterprise-class applications and workloads, PowerMax is optimized for dense server virtualization and SDDC, SAP, Oracle, SQL Server along with other low-latency, high-performance database activity. Different target workloads include Mainframe as well as Open Systems, AI, ML, DL, Big Data, as well as consolidation. The Dell PowerMax is an all-flash array (AFA) architecture with an end to end NVMe along with built-in AI and ML technology. Building on the architecture of Dell EMC VMAX (some models still available) with new faster processors, full end to end NVMe ready (e.g., front-end server attachment, back-end devices). The AI and ML features of PowerMax PowerMaxOS include an engine (software) that learns and makes autonomous storage management decisions, as well as implementations including tiering. Other AI and ML enabled operations include performance optimizations based on I/O pattern recognition. Other features of PowerMax besides increased speeds, feeds, performance includes data footprint reduction (DFR) inline deduplication along with enhanced compression. The DFR benefits include up to 5:1 data reduction for space efficiency, without performance impact to boost performance effectiveness. The DFR along with improved 2x rack density, along with up to 40% power savings (your results may vary) based on Dell claims to enable an impressive amount of performance, availability, capacity, economics (e.g., PACE) in a given number of cubic feet (or meters). 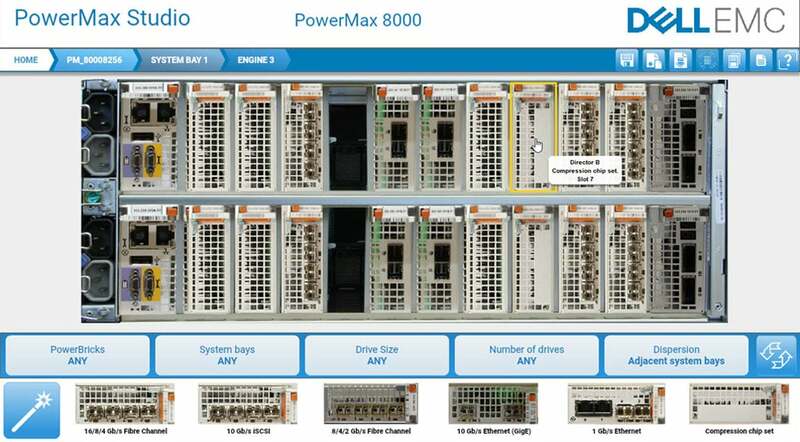 There are two PowerMax models including 2000 (scales from 1 to 2 redundant controllers) and 8000 (scales from 1 to 8 redundant controller nodes). Note that controller nodes are Intel Xeon multi-socket, multi-core processors enabling scale-up and scale-out performance, availability, and capacity. Competitors of the PowerMax include AFA solutions from HPE 3PAR, NetApp, and Pure Storage among others. Besides resiliency, data services along with data protection, Dell is claiming PowerMax is 2x faster than their nearest high-end storage system competitors with up to 150GB/sec (e.g., 1,200Gbps) of bandwidth, as well as up to 10 million IOPS with 50% lower latency compared to previous VMAX. PowerMax is also a full end to end NVMe ready (both back-end and front-end). Back-end includes NVMe drives, devices, shelves, and enclosures) as well as front-end (future NVMe over Fabrics, e.g., NVMeoF). Being NVMeoF ready enables PowerMax to support future front-end server network connectivity options to traditional SAN Fibre Channel (FC), iSCSI among others. PowerMax is also ready for new, emerging high speed, low-latency storage class memory (SCM). SCM is the next generation of persistent memories (PMEM) having performance closer to traditional DRAM while persistence of flash SSD. Examples of SCM technologies entering the market include Intel Optane based on 3D XPoint, along with others such as those from Everspin among others. To help with customer decision making, Dell has created an interactive VMAX and PowerMax configuration studio that you can use to try out as well as learn about different options here. View more Dell PowerMax speeds, feeds, slots, watts, features and functions here (PDF). Dell XtremIO X2 and XIOS 6.1 operating system (software-defined storage) enhanced with native replication across wide area networks (WAN). The new WAN replication is metadata-aware native to the XtremIO X2 that implements data footprint reduction (DFR) technology reducing the amount of data sent over network connections. The benefit is more data moved in a given amount of time along with better data protection requiring less time (and network) by only moving unique changed data. Dell EMC claims to reduce WAN network bandwidth by up to 75% utilizing the new native XtremIO X2 native asynchronous replication. Also, Dell says XtremIO X2 requires up to 38% less storage space at disaster recovery and business resiliency locations while maintaining predictable recovery point objectives (RPO) of 30 seconds. Another XtremIO X2 announcement is a new entry model for customers at up to 55% lower cost than previous product generations. View more information about Dell XtremIO X2 here, along with speeds feeds here, here, as well as here. What about Dell Midrange Storage Unity and SC? Here are some perspectives Via SearchStorage: Dell EMC midrange storage keeps its overlapping arrays. One of the questions I had going into Dell Technology World 2018 was what is the status of ECS (and its predecessors Atmos as well as Centera) bulk object storage is given lack of messaging and news around it. Specifically, my concern was that if ECS is the platform for storing and managing data to be preserved for the future, what is the current status, state as well as future of ECS. In conversations with the Dell ECS folks, ECS which has encompassed Centera functionality and it (ECS) is very much alive, stay tuned for more updates. Also, note that Centera has been EOL. However, its feature functionality has been absorbed by ECS meaning that data preserved can now be managed by ECS. While I can not divulge the details of some meeting discussions, I can say that I am comfortable (for now) with the future directions of ECS along with the data it manages, stay tuned for updates. What about Data Protection? Security was mentioned in several different contexts during Dell Technology World 2018, as was a strong physical security presence seen at the Palazzo and Sands venues. Likewise, there was a data protection presence at Dell Technologies World 2018 in the expo hall, as well as with various sessions. What was heard was mainly around data protection management tools, hybrid, as well as data protection appliances and data domain-based solutions. Perhaps we will hear more from Dell Technologies World in the future about data protection related topics. If there was any doubt about would Dell keep EMC storage progressing forward, the above announcements help to show some examples of what they are doing. On the other hand, lets stay tuned to see what news and updates appear in the future pertaining to mid-range storage (e.g. Unity and SC) as well as Isilon, ScaleIO, Data Protection platforms as well as software among other technologies. Continue reading part IV (PowerEdge MX Composable and Gen-Z) here in this series, as well as part I here, part II here, part IV (PowerEdge MX Composable) here, and, part V here.